The ongoing “Best of 2009″ idea continues with: Insight or aha! moment. What was your epiphany of the year? My aha! Moment was slow coming. It happened a bunch of little times, but it only really dug home when I was checking in with my inside people (I love that phrase now, btw) Christmas Eve and realized The Universe has been telling me, little by little, one thing this year. 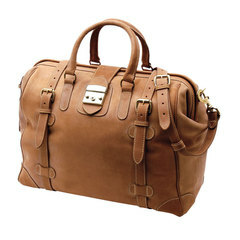 the travel bag of the century. le swoon. Travel. Travel light, travel often, and travel with care. With so many people scared about the economy and how they are going to survive without money, us people with jobs have to take stock of what is important – truly important – in our lives. And everyone is different in what is important to them. Cable? No, cable is not something I need in my life. Netflix is all I will ever need. More “stuff?” Well, that is to be determined by how much old stuff I can get rid of; but probably not. I have decided to be more active in pursuing…well, motion. Even if it is only across town, I want to travel and discover something new and magical. I am through with sitting idly by while my daydreams take up my whole day. I want to pick up and go. A weekend at a time.